Is there any way to avoid grease splatter? I often cook fries in a skillet. I put about 1/4 cup vegetable oil into a large skillet and heat on high, then I toss in some frozen fries. As soon as I toss them in there is an explosion of grease that makes a huge mess. After it simmers down though, I can cook the fries without spilling anymore grease. Is there anyway to avoid the initial uproar? Use a deeper dish. Fries shouldn't be fried in a skillet. Use a 4+ quart pan. Then cover with a metal screen to reduce the splatter. 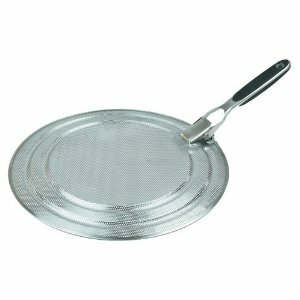 1) You can buy a splatter shield - it's a very fine wire mesh on a long handle. It works very well. 2) One of the things that can cause splatter is when water or ice hits the oil -- make sure your fries are as dry as possible before putting them in. It's a rather unavoidable part of cooking things like bacon or sausage. I would advise against a lid, and instead use a splatter screen. The lid will keep the spatter in, but it will also change the cooking time and even method of your food. Putting the lid on can effectively begin steaming your sausage, which may not be desired. The splatter screen will let steam escape but catch the little grease pops which are unavoidable. Put a lid on your pan. It's physics really. The downside is that you will end up with a lid that needs washing. Not the answer you're looking for? Browse other questions tagged frying or ask your own question. How to fry meat without spattering oil? How do I stop the spatter? Is there a fool proof way to fry sausage? Should you avoid cooling a frying pan with water? Easiest way to bread chicken for frying? Is there a way to make delicious donuts with a small amount of oil? Why does my pan always splatter when I make chicken breasts? How to avoid burned layer on seared hamburger? How do you avoid getting burnt by hot oil? Using a paper towel as a splatter shield: Great idea or terrible accident waiting to happen? Is there any danger slicing pickles hours before frying them? Is there a way to treat any firm cheese so that it can be fried?